I didn't spend months planning for the Great American Eclipse. Truth is, I've been deeply distracted for the past several months remodeling our "new to us" home. My camera has been very lightly used, so much so that my batteries had all depleted and my tripods were coated in a thick layer of dust. If not for a recent five-day private workshop I lead for a handful of clients my skills with the camera would have been just as dusty. But a total solar eclipse is something I would hate to miss. I lightly remember the last one we had in the Pacific Northwest. I was 9 years old and it was cloudy, but I still recall the strange darkness and the excitement around something I barely understood. I didn't want to let this opportunity to experience this eclipse slip by, but I almost did. Here in Portland, the local news has been buzzing about the impending event for months. Cautionary tales of epic traffic congestion and even the collapse of some basic services had me spooked. I can handle some inconvenience for the chance of a lifetime viewing of a total solar eclipse, but my wife, 6 year old son, and 3 year old daughter might not be so game to suffer for science and some cool photos. So I back-burnered my plans to head to central Oregon where the wide open high desert was sure the offer the best weather, scenery and location directly in the center of the eclipse's totality swath. I had settled on enjoying Portland's 99.2% partial eclipse, which I assumed would offer 99.2% of the excitement of the full deal with none of the hassles. I was all set to stay home until a friend, Gordon Laing, urged me to seek out totality. "99.2% isn't going to be enough!" he said. He explained that unless you are in the band of totality, you won't see the sun's corona, won't experience the total darkness, won't feel the chill. He got me thinking that the risk was worth the reward so I talked with my ever-understanding wife Julie and she agreed that we should go for it. I decided to wait until the night before the eclipse and survey the weather, traffic and wildfire smoke conditions before selecting our target. On Saturday, (after a very long day of tiling a bathroom shower), I gassed up the Jeep and packed our snacks, blankets, clothes and my camera gear. In my evening check of the interwebs I determined that heading to the eastern side of the Cascade Mountains would give us the best shot of fog- and cloud-free conditions. Wildfire smoke was a concern, but not too thick. I chose a meadow near Timothy Lake southeast of Mt. Hood and just inside the swath of totality. I told Julie about the meadow and she gave me a thumbs up. When my alarm woke me at 4 a.m. I checked the traffic maps for our route through the mountains and everything was green. I loaded the car and we woke the kids and hit the dark road at 5 a.m. Driving Highway 26 from Portland up and over the flank of Mt. Hood was smooth and easy. There were some other cars on the road with us, but we all kept to the speed limit and rolled along nicely. As the sky lightened, I decided that our original target at the meadow might not be close enough to the center of totality. I decided to press on for Madras. Madras, Oregon is a cute little town of 6,500 people. It was quickly cited by NASA and just about everyone else that Madras was one of the very best locations for viewing the eclipse. Sitting right on the center line of the path of totality, the high desert air was likely to be clear and the chances for an unobstructed view were very high. Every hotel room, Air B&B and camp site within miles of Madras went months ago. Farmers around town mowed their fields and gridded out sprawling campgrounds in the dirt. Madras was the epicenter of the eclipse and the little town was bracing to welcome up to 200,000 people for the long weekend. As we neared Madras we drove my field after field covered in tents, RVs and cars. Acres and acres of people, many lined up dozens deep to get into the rows of porta-potties set up for them. We pulled into the packed parking lot of the Safeway so Julie could get a coffee and I looked around to see people everywhere. Some standing on roofs, others near tents set up in parking lots. Julie returned to report that the bathroom line was 30 people long and the Starbucks line even longer. We bailed and went through town where the Thriftway store seemed less insane. I took a turn in the bathroom line, which wasn't so bad but still took 20 minutes. Julie and Cooper went next and made it in 15, but there was still no coffee to be found. While waiting for Julie, I pulled up the map on my phone and spotted a town park that looked nice a few blocks away. Based on the satellite image the park had a playground, so I suggested we go there so the kids could burn off some energy. I figured it would be overflowing with people and that after 30 minutes of play we could head north and look for a spot along the highway and away from the crowds. We were delighted to discover the park was not crowded. In fact, it was pleasantly open with large areas of green grass open for use. Porta-potties were set up and none had lines. Across the street a handful of food trucks were setting up and I knew right then and there we had found our spot. It was an oasis of calm, cool relaxation in a sea of dusty humanity. We laid out our blanket and I set up my tripod. The kids played on the playground and I found great coffee at one of the food trucks. For not planning this was going swimmingly! As the eclipse began, we donned our free Amazon.com eclipse glasses, (Amazon refunded our money but the seller of the glasses provided proof that they were indeed safe, so there you have it). As the moon nibbled at the disc of the sun I set up my camera and lounged in the grass. The weather in Madras was pleasantly warm. There was a slight smoke haze to the sky from Wildfires in the mountains, but otherwise the sky was clear. For an hour we took glances at the progression of the eclipse while eating snacks and playing. At about 10 a.m. I could tell it was getting darker. It was a gentle transition that one could have missed. It was also getting a little cooler and I thought it seemed like things were also quieter. The 200 or so people sharing the park with us spent less time playing and more time looking up with glasses on. About 50 other photographers had their cameras up and filtered. I had my Sony a6300 mounted on my Sony FE 100-400 G Master lens and a Firecrest 16-stop ND filter. I was having trouble getting sharp focus, so as it got darker I switched to the A7R Mark II and a Breakthrough Photography 10-stop filter. Now I was getting sharp images! The Sun looked like a banana, then a clipped fingernail. As the moon began claiming the entire disc of the sun, I pulled off the ND filter and worked fast to capture totality. Right before darkness set in, I grabbed my Fuji X100F and made some portraits of Julie and the kids. The light was magnificent. Not at all like twilight, the light of the last sliver of sun was metallic, I think everything looked like it had a bronze glow. It was enchanting. I went back to the Sony and began bursting through frames as the sun slipped behind the moon. I was manually focusing and eye-balling the exposure, but it seemed to me that the more under-exposed shots looked better. Despite being in totality, the sun's corona was still fairly bright. With no filter in place, I had the choice between bright corona and midnight blue sky or a sharper ring of corona and more detail in the fine colors around the disc of the moon. I opted to go dark and I am happy I did. While I couldn't see them in my viewfinder, I was capturing several prominences, or solar flares shooting out from the surface of our star. Totality only lasted about 90 seconds, and those seconds flew by in a whir of telephoto shots. I took about 30 seconds to look around at the 360-degree sunset on the horizon, as well as snap a dim iPhone shot of Julie and the kids. When the sun began its slow crawl back to illuminating us, I fired away. 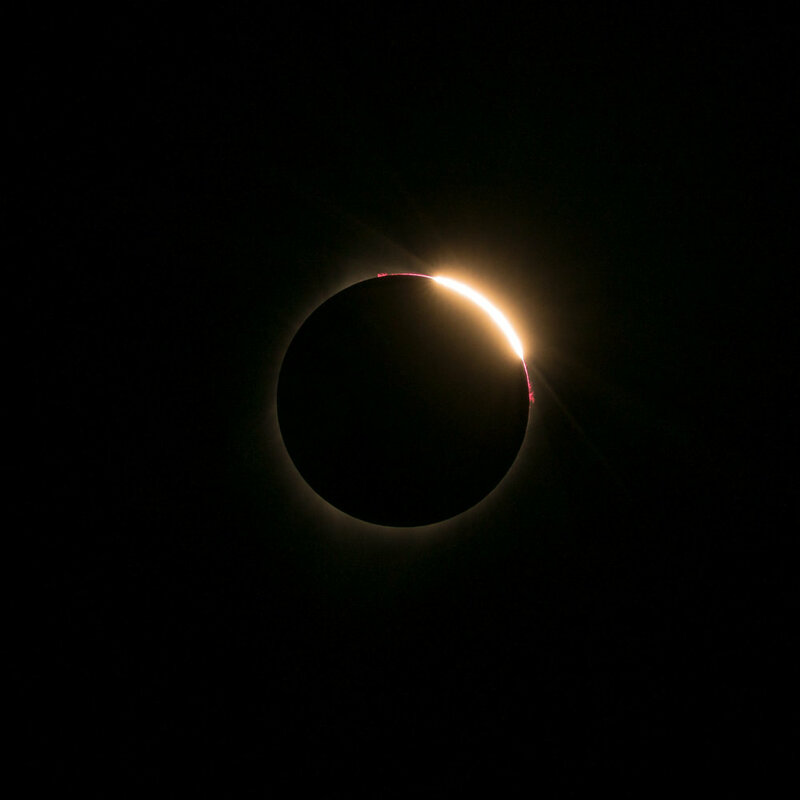 As it turns out, my shots of the "wedding ring" as the sun went into totality were slightly out of focus. I blame my rush to get shots and my somewhat blurry vision from switching between my naked eyes, eclipse glasses and the camera's viewfinder. My eyes have been giving me troubles as of late, but that's a topic for another day. Suffice to say that I was on my game for the re-emergence of the sun and I am thrilled with my results. Once the sun was shining upon us again, I felt the urge to pack up and run. I had a feeling the crush was going to be upon us as everyone in Madras tried to head home. Julie was less concerned, and I slowed my packing and went back to watching the other half of the show through my eclipse glasses. Once the kids had another good romp on the playground, we headed out into the absolute worst traffic I have ever seen. our location on the north end of Madras spared us the slow crawl through town, but the massive "SolarTown" and "SolarPort" gatherings were between us and home so we were in the thick of the jam right away. From our turn onto Highway 26 and the Madras Airport is about three miles. We made our turn onto the road at 11 a.m. and reached the airport at 2:30 p.m.! It was excruciating. We would roll ahead about two car lengths, then stop, shut off the engine and wait for about 10 minutes. Rinse and repeat. At the airport, we took to back roads and snuck ahead of much of the problem. The slow roll to Warm Springs kept to a smooth 5 to 10 miles-per-hour. When we hit Warm Springs I checked the traffic map and it was red all the way to Portland so we left the highway for a very enjoyable drive on smooth roads through the Warm Springs reservation. By going waaay out of our way, we traded miles for the gridlock and made it home at 6:30 p.m. As much as I hate traffic, I think it was worth every second. #1 - We will stay an extra day next time. I didn't mind traveling to the site on the day of the eclipse. It was worlds better than camping in hot dirt would have been. I do wish we had secured a hotel room nearby for the night after so we could relax and enjoy the day without dealing with the traffic. #2 - I will get a longer lens next time. I shot the totality with the A7R Mark II set on APS-C mode, which crops the image and decreases the pixel count in exchange for more reach. My 100-400 G Master is a superb lens, but too short for the fine details I wish I could have nailed with full-frame resolution. I think a 2X extender on the 100-400 would have worked well, but something in the 1,000mm family would have been sweet. #3 - I will shoot wide for the partial portions of the show and save the long lens shots for totality. Being in a remarkable location with a great vista (foreground elements), would have been a great opportunity to employ a 35mm or wider lens for atmospheric shots and those cool shots where the sun is displayed multiple times across the sky through the duration of the eclipse. Hudson Henry, Colin Smith, my friend Andi Wolfe and others pulled off these types of shots very well. Telephoto shots of the "bitten cookie" partial eclipse must be made through intense filters which render things flat and monochromatic. I don't like any of my partial shots because they bore me. Gordon Laing was right, the magic is in totality. Everything else is cool to watch but not so great to shoot. #4 - Always seek totality, and as much as you can get. 90 seconds was cool, but I'd love to have 5 minutes to make images of totality. Being directly on the center of the swath gives you the longest show. I won't ever feel compelled to compromise for a partial eclipse again. Having lived through totality, I can vouch for the fact that it is worth working for. #5 - I am enjoying the shots several people made yesterday of people rock climbing during the eclipse. Next time, I'd like to include a human element with the sun in totality. It requires a lot of planning, practice, and luck, but the shots are epic and with the flood of close-ups like mine, something different really jumps out. Of course, as soon as you pull off an amazing shot like the ones made at Smith Rocks yesterday, every lazy asswipe on Facebook will say your shots are fake. Nobody likes a whiny loser. #6 - Video. Once of the great parts of the experience yesterday was the audible gasps, cheers, and oohs and aahs from the crowd watching the sun slip behind the moon and then when it re-appeared. I would have liked to have a video of a group of people experiencing the eclipse on that primal, emotional level. It was amazing. #7 - I loved having my wife and kids with me for this experience. I really enjoyed sharing the awe and amazement with them. Despite my pull to make lots of photos, I am glad I took some time to look up at the sun with them and hold them close. If I had been there alone, I would not have loved the show so much. But I would have enjoyed the drive more. Whining kids give me headaches! I see the next eclipse on the west coast is in 28 years. I think I'll be there. Will you?